Beautiful, hand sanded Australian Redgum serving platter. Accented with twisted wrought iron or pewter handles, theses generously proportioned Tavern serving platter certainly take centre stage on the table. A serving platform for cheeses, appetizers, antipasto, tapas, cupcakes, deserts or even chocolates. Great as a share platter of any nature or presenting a breakfast of croissants and coffee. The twisted handles add a dramatic medieval feel. At home in a tavern, castle, provincial farmhouse or would also be lovely as a rustic accent in modern setting! 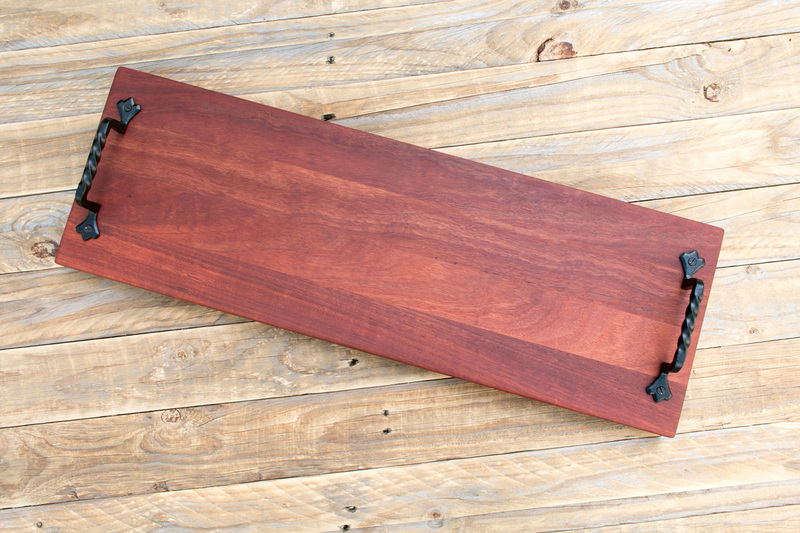 Handcrafted from FSC-certified Redgum and sanded to a satin smooth finish these platters make a statement on any occasion. Finished in a two coats of organic virgin jojoba oil to protect them from drying out and to produce a beautiful shine. Our obligation to the environment means that we source wood that is durable and, if well cared for could be handed down from generation to generation. ACCESSORIES SHOWN: Organique Cheese Set and Luxe Cheese Set. For demonstration purposes only. Cheese Sets not included in product price. Gift packs available soon.